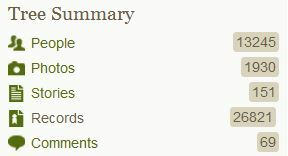 Randy Seaver’s Saturday Night Genealogy Fun for this week is genealogy database statistics. My genealogy database management program is Legacy. Until 2008, I was just a research helper to my daughter so didn’t have our genealogy information other than an occasional hard copy Kay printed of direct line people. We were on a research trip and I asked her if it were possible for me to have a copy of the database to be able to look things up without having to wait for her to get home from work. Our hotel room had WIFI access so we searched for free genealogy database programs and chose Legacy. I installed the program while Kay converted her family file to a GEDCOM and saved it to a USB drive. We then loaded the GEDCOM into my new program and I had my own copy. Since I was not our major family researcher and our programs weren’t synced I didn’t do anything but access the program for a year or so, but finally I began putting up an Ancestry.com free tree. After a while, I would occasionally access Ancestry on Kay’s account where I discovered I could attach records in support of what we were learning about our family members. Soon, I was having so my fun, I got my own Ancestry account and started into full research mode. One of the things I’ve learned by keeping a database and searching for the documentation that is the framework of what we are learning is that genealogy isn’t just a matter of putting names and dates on a tree, but it is learning something about the people who made up the heritage that led me to be who I am and where I am. As was often the case during the 19th century, Zedic Hamilton ‘Zed Hamp’ Willis was born into a family that had known its fair share of tragedy and loss. His parents, James Franklin and Mary Jane Buckner Willis had each lost their fathers to early death. According to probate files, J.F.’s father had died when J.F. was about two years old after having been ill for quite some time, leaving the family insolvent. His mother, Amy Collins Willis, had married her brother-in-law, William Jabez Willis, following the death of her sister, Judah, and completed the task of raising her nieces and nephew as well as the one child born to her from her marriage. Following the death of her husband, she lived as part of a trio of widows that included Sarah Collins Graham (her sister) and her three sons, and Eady Caroline Willis Ballenger (her stepdaughter and J.F.’s half-brother) and her two sons – a farm household of three women and six boys. So J.F. was raised by a single mother in a time when women usually had to have a husband just to survive. Zed’s mother Mary Jane Buckner Willis’ father had died when she was about six years old as a result of illness contracted on a battlefield during the Civil War. After being a single parent for almost six years, her mother remarried a much older widower and added five more children to the four from her first marriage. Zed’s mother died sometime before 1900 – family tradition suggests she died in childbirth around 1885, when Zed was four. His father never remarried so the woman in Zed’s childhood home was his grandmother, Amy Collins Willis. His father, J.F., was a Baptist minister who presumably was required to spend his days as a farmer to provide for his family because the monies paid to him by the churches he pastored was too minimal to suffice. Prior to leaving South Carolina, his father, mother and both sets of grandparents had participated in a church that focused on sin and discipline, where the congregation was encouraged to name names and deeds within the regular congregational meetings and those so named were disciplined by removal from the fellowship of the church family until they could show cause their behavior warranted a return to fellowship. [Not very pleasant reading but the link above is provided for anyone who wishes to review attitudes toward sin in early churches.] I suspect this resulted in a home environment of the mixed messages of love as well as guilt and punishment. When Zed married Mellie Jane Welch November 15, 1900 in Fayette County, Alabama his family history merged with hers, which included its own pain and loss. Mellie Jane’s father had also been raised by a mother who remarried following the death of his father when he was about two years old (we tend to think blended families are a relatively new invention due to divorce but earlier times had them due to early deaths as well divorce and desertion). Mellie’s mother was the only one of either family raised in a home with both parents – although it’s difficult to imagine it was an ideal home since her father had a mistress living in the same small community with whom he had three children during the same years he was having children with his wife [full siblings born when Mollie was 2, 8 and 11 and half siblings born when she was 7, 9 and 11]. Compounding the losses they had already sustained, Zed and Mellie’s first child, a daughter, Mary Eunice, died shortly after she was born about 1902-1903. During the next few years, they had four sons and a daughter who were healthy and survived into adulthood. Those same years of adding children also included the deaths of the grandmother who had raised Zed, sometime between 1905 and 1910, and Mellie’s paternal grandmother as well as Zed’s sister, Margaretta Willis Ward who died leaving two sons, 14 and 10 to be raised in various households throughout their lives. Christmas Day of 1910, Zed and Mellie had another son and again in 1913 a sixth son. In about 1914 they had another daughter, Rachel, who also died as an infant. Mellie’s sister Dena married Zed’s brother Rufus and two of their eight children died at birth – in 1916 their daughter, Estelle, and again in 1918, their son, Kilby. In addition to the personal losses within the family during this decade, our country was at war – World War I with friends and family being called to foreign lands to battle again for freedom and adding economic strain to the whole country. Dena apparently did not fare well emotionally [family members who knew her said she was ‘crazy’ although she seemed quite normal to me when I met her in 1958]. The census records for Dena and Rufus show them living alternately in Fayette County, Alabama and Itawamba County, Mississippi. Then in 1936, Rufus committed suicide; my Aunt Rubye told me he stabbed himself in the heart as though that might stop the hurting in his heart. In addition to the deaths of immediate family members, tracking Zed and Mellie through census and land records indicates a relatively unsettled life [map below shows their migration pattern]. They were both living with their families in Fayette County, Alabama for the 1900 census (marrying in November of that year) and their first three children were born in Fayette County in 1902, 1903 and 1904. By the 1910 census they were in Itawamba County Mississippi, about 60 miles northwest of Fayette County with children born in that county in 1906, 1907, 1909 and 1910. Their last son’s birth in 1913 was back in Fayette County. The 1920 census had them in Smithville, Mississippi, a community about 50 miles northwest of Fayette and about 17 miles south of their former home in Itawamba County. According to a letter from my aunt by marriage, Madge Lowell Willis, Zed and Mellie were in Purcell, Cleveland, Oklahoma by about 1923;, in Hockley County, Texas for the 1930 census; Oklahoma City in a 1936 city directory; and in Noble, Cleveland, Oklahoma from 1937 until Mellie’s death in 1938. Zed remained in Cleveland County until his death in 1942, although according to a 1942 draft registration, he was living in Norman rather than Noble. Although tragedy and loss still visit every family, we can be grateful to have been blessed in the progress of medicine and technology to give us better odds than those faced by our forebears.